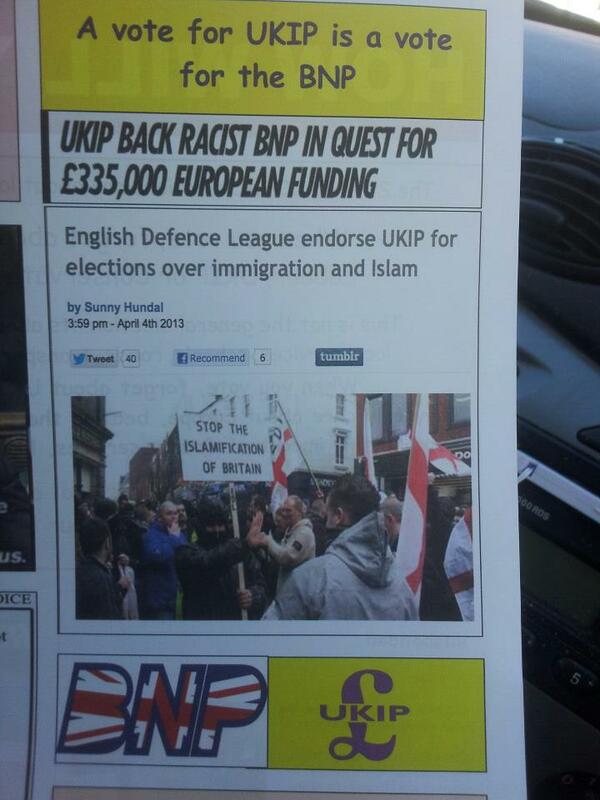 The fake UKIP leaflet being distributed in Lancashire has attracted a great deal of media attention with the local party inundated with requests for interviews from radio and newspapers wanting to talk about it. Probably not what Cumbria County Councillor, Tina Macur, was hoping for when she put the leaflet out but then if she was bright she wouldn't be a Tory. It's not just Labour and the Conservatives indulging in negative campaigning though, this leaflet is being distributed in Debden and is believed to be the work of Loughton Residents Association (a political party contesting these elections). The claims in the leaflet are nonsense of course. A vote for UKIP is a vote for UKIP, the party hasn't backed the BNP for anything and UKIP has no control or influence over whether the EDL or any other group decides to support the party. UKIP is still the only party to ban past and present members of the BNP, National Front, EDL and other extremist groups from joining the party.